Denny Jump (Bellevue, WA, United States) on 17 November 2013 in Miscellaneous and Portfolio. as if it is tap dancing for mother nature. How can we help but smile as we walk this lonesome road? A powerful image in so many ways . . railroad tracks always seem to be carrying a message of some kind. Superb light. Awesome sparkle on the railroad. Beautiful light dancing on the wires and rails. A superb shot, Denny. I love how the sun makes the tracks glow, and the curving of the tracks! Wonderful POV! A great image! 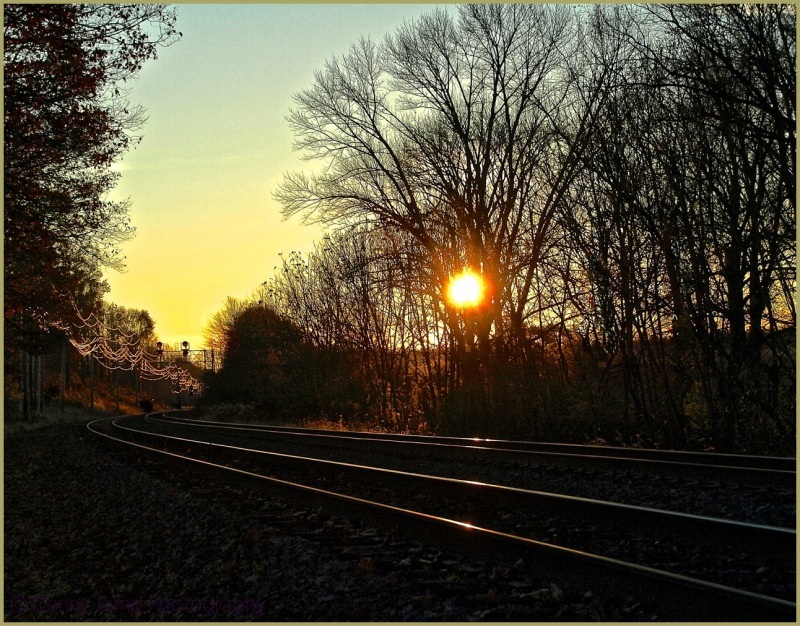 Love how the light enhances the tracks and power lines … great frame and capture, Denny! Superb. I love the aspect taken by the wires becoming like Christmas' decorations, the composition, the framing, the position of the sun and the light softly hitting the railway. Tracks catch sun beautifully here ! Nicely spotted and captured scene here Denny...great light ! excellent composition and light! love the curve of the train tracks taking the eyes right through!